Guy Moshe is a director to keep an eye on. While not fully successful, Bunraku is bold and often exceptionally entertaining. An animated history of man's violent conflict over resources opens the story, flowing into a third world war that results in the banning of all firearms. Blades, bludgeons, bows, fists and feet are the weapons of choice in the new world order. Society has divided into warring clans that engage in formal battle for leadership of territory. Nicola (Ron Perlman) is the Wood Cutter, a fearsome assassin currently holding power. Groups of up to 20 rival clansmen are permitted to issue a challenge, but Nicola sends only his number two man - a visual tally of his top ten assassins drops on screen as they're identified - to defend on his behalf. Dynamic, swooping camerawork gives the well-choreographed fight scenes a bombastic stylistic flare that works perfectly with the environment's unique aesthetic. With folded paper and crayon-shaded skylines, it looks like Bunraku exists inside of an origami pop-up book. Even the subtitles in the Japanese segments are organically integrated into the film's art design in a way I've never seen before. There's a lot of slightly convoluted plot stewing that's intentionally over-explained by the narrator (Mike Patton!) as part of the cheeky oddity that is Bunraku's sense of humour. 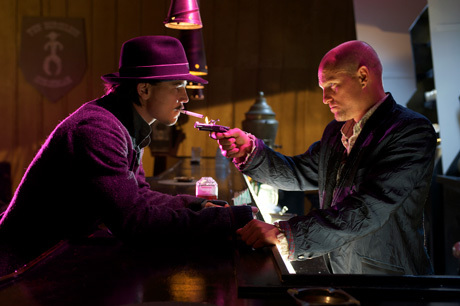 Josh Hartnett is surprisingly effective as a cocky drifter; he's a gunslinger who only uses his fists. He also sniffs cigarettes and cigars but doesn't smoke them and has a Loony Tune-esque sound effect applied to the stroking of his hat rim. This zany cartoon sensibility points Bunraku towards Kung-fu Hustle territory and fans of one stand a good chance of enjoying the other.